The present influences what we believe about the past. Who was Jesus? A myth? A good man? A teacher? A prophet? Much hinges on the answer to that question. The Apostle John answered that question in the prologue to his Gospel. Jesus, the Word, was in the beginning. He was with God. He was God. He created all there is. He became a man. He was rejected. He gives life to all who believe in him. Did the early disciples actually believe this? Or was this a later construct? The John Rylands Library at Manchester, England houses fragments of ancient writings. In 1934 a fellow at St. John’s College at Oxford was sorting through some papyri from Egypt. 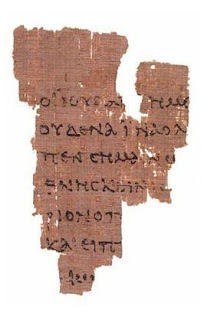 He found a small fragment of the Gospel of John. Since penmanship constantly changes over time, papyri can be dated by its writing style. Originally dated by paleography to 117 – 138 AD, most scholars currently it date to 125 – 150 AD. John was an eye witness to the life, death, and resurrection of Jesus. Although it is traditionally believed that John wrote his Gospel while in Ephesus around 90 AD, he most likely wrote it before the Sheep Gate in Jerusalem was destroyed in A.D. 70. His eyewitness account was copied and a copy made its way to Egypt. Within 100 years of Jesus’ death, Christians in Egypt had written eye witness testimony that Jesus lived, died, was buried and came back to life, and that he is God! The John Rylands Papyrus P52 shows that there was no time for myth and legend to develop between Jesus’ death and the Gospel of John showing up in Egypt. The early disciples believed Jesus was God. This was not a later construct. I set John’s prologue to music and incorporated it in a musical. This video is scrolling playback of the song. 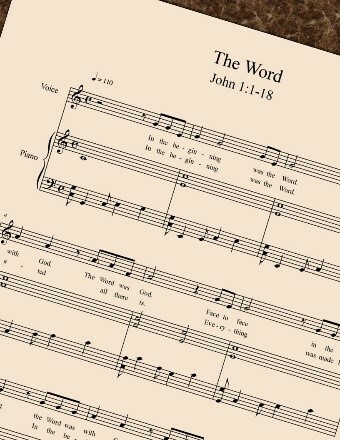 Print (PDF) and digital (MusicXML™) sheet music for The Word are available at the MusicStories shop on Etsy.com. 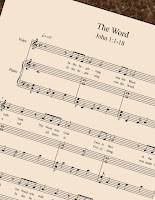 Click here for The Word at MusicStories.